Several women, all bored with their menial lives, join a lesbian pirate ship and set sail on a kooky adventure. 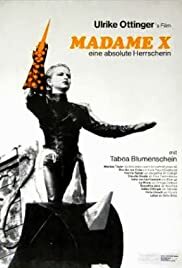 Like a prior reviewer, I saw Madame X at Anthology Film Archives. It was maybe 20 years ago and I was delighted. I also saw Ulrike Ottinger at Anthology and was also delighted! I don't recall if Madame X was showing when the director was there or whether I saw it on another occasion. In any event, the movie is wonderfully playful and filled with a mirth I love. Yes, there is undoubtedly one or more "x"-ist readings you could do, but I simply enjoyed what I was seeing. In fact, I'd say the movie invites the viewer to do any number of readings desired. But the amazing thing is that it doesn't force the viewer to do that. It merely invites it. That's a fine quality. I still chuckle over the movie when I recall it to my best friend, who saw it with me. And the bearing and beauty of the main character has stayed with me all these years, as well as the characters portrayed by the other actors. The shots and direction are simply excellent.